In conclusion of Native American History Heritage Month, I have given much thought to what has transpired. The election and its aftermath, the continued efforts of the water protectors of Standing Rock, the misrepresented holiday of Thanksgiving, and the Cheyenne & Arapaho runners for the memory of Sand Creek. One amazing collection of words always allows me to continue my efforts in telling a story. Simon Ortiz is the author of several volumes of poetry and anthology collections; which have won him numerous accolades. From Sand Creek was published in 1981 by the University of Arizona Press. It is considered to be one of his most acclaimed, preceding Woven Stone (1992). By ‘history’ I mean the history that includes me personally as a Native American, the history that includes Native People and our culture, the American history that I and other Natives sometimes felt foreign too. In his writing, I discovered the structure where two types of interactive dialogue face each other. The two dialogues facing each other are forces that reconcile each opposing voice in perpetuity. This juxtaposed style, fulfills the nature of issues I have faced in my identity as a Native American. Through the development of this country, leaders who continue to push the United States in its progressive direction have deliberately forgotten to include its original inhabitants, altering its history, like the grass that has overtaken the landscape, over time. As the statement opens the writing, the epilogue addresses the issue of “covering-up / hiding”, using the analogy of the time it takes for grass to cover a landscape, leaving no trace of an origin, erasing the residue of a ‘misplaced’ crime scene or forgotten memory. Because, this situation happened in a remote location, it is more easily forgotten, until some attention is brought to it. and a spring wind / rising / from Sand Creek. The acknowledgement of an event takes a brave assurance, which one must ‘believe’ in the occurrences of a memory, which will be formed and remembered. This convincing notion asserts the primary foundation, in which our memories are based on creating a belief system to a series of events, which establishes our identities. A denial of historical events, or the un-acknowledgement of a particular history, nullifies the existence of a particular event and invalidates the course of that particular history. This is the premise of Ortiz’s collection. The establishment of ‘belief’ or what drives the desire to recollect memory, regardless of a persuaded hypocrisy, or disillusioned history. 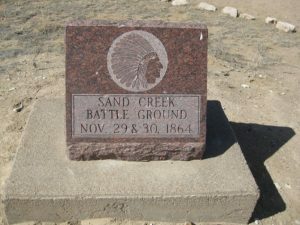 The repetition of the phrase ‘believe it’ reinforces the notion that the reader and the writer, must be convinced of an occurrence, in this case a history of a specific incident, that being, “Sand Creek” and the battle / massacre which occurred, given the perspective. the hone and sheer gone, / just the brute / and perceptive angle left. left still; / the words from then / talk like that. Ortiz forces the reader to analytically approach the historical significance of being Native American, and to view the experience of Native American identity through his use of imagery and persona. In various instances throughout this body of work, he coerces the reader to take on the persona of the voice. This technique creates a closer connection to events and allows the reader to become a sort of avatar within the poem. The imagery is so specific; it eliminates any confusion to the event taking place or identity that is speaking. He is Indian. / He hides and tends / the shape of his face. His cough / Is not the final blow, / But the glass wall / Stares so closely. / Makes him afraid. / Closely, / Toby tends his shadow. our mission / unknown to them. The magpie is determined / to freeze. The unjust nature of the event addressed in this collection is profound. With the many mislabeled massacres that took place during the latter part of the 1800’s, the information became misrepresented. Many tribal people were labeled as rebellious ‘savages’ refusing to assimilate to the progress of the United States. In later years the concept of assimilation had nestled itself within the identity of many Native American people, who choose not to live on a reservation. The constant coding and decoding of European culture dominated, which influenced much of today’s Native American population, furthering the dissolution of Native culture and tradition. 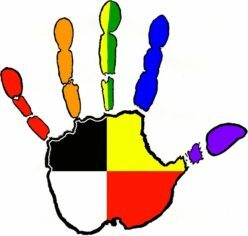 Many Native individuals who leave the reservation, often merge the two cultures in a hybridization of identity. This fluid development of survival in the oscillated nature is an experience of a “transitional Indian”. It is an adaptation that is identifiable within the context of Native American memory, cosmology, language, culture of identity coinciding with the existence of living in a Western identity. Sky is panned / concave, / the eyeballs / blanch. Memory / is shriven / clean / as Kansas stateline. as knuckles / around gunstock / around steering wheel. The emphasis on memory, as the basis of identity, is how it validates a historical identity through writing. The use of language and lucid imagery helps shape the telling of a particular history, or any history. This kind of storytelling, offers a new kind of revision towards history, which establishes a relationship with the reader, no matter the intensity of the disparity. In the respect of language and persona, it is important to specify the stitches of memory, to visualize and envelop a more tangible history. History will always be in constant flux. With innovative writing attitudes towards decolonization of Western approaches, indigenous storytelling and poetics can re-document history, and will not undergo the oppressive subjugation by Western influence. but wealthy with love / and compassion / and knowledge. And it will rise / in this heart / which is our America. These boundaries which define our existence, confine our experience, and blocks our memories, can be unwound. What Ortiz presents within this body of work, can add to a creative attribution in writing. There are many facets to this body of work. Every aspect is influential and furthers the development of story and memory. The mesmerizing orchestration of language and imagery, linger constantly, like the memory in the “steaming rivers of blood” which still remain on those eastern Colorado fields, or on every field which experienced a massacre. This discourse leaves an uncertain quiet heaviness. Ortiz’s writing is the “sieves of helpless hands” in which the blood flows off. I must become a part of the strain of memory, that drip of history, left out on those fields, and finish telling the story. Ortiz, Simon. From Sand Creek. Tucson: University of Arizona Press, 2000. Print. Kelman, Ari. A Misplaced Massacre. Cambridge: Harvard University Press, 2013. Print.